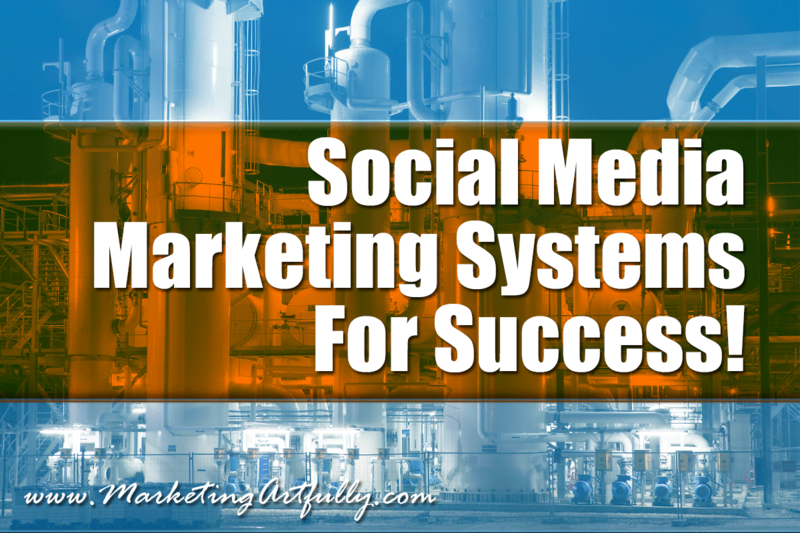 Social Media Marketing Systems For Success! You are here: Home / social media / Social Media Marketing Systems For Success! Social media marketing is supposed to be all loosey goosey, just surfing around the internet, having fun and finding great “stuff” to share. But if you are doing social media marketing for your business, it stops being fun and starts to be work. Do you have enough posts to go out? Have you gotten the right mix of sales messages to industry posts? For goodness sakes, how much time are you really supposed to be spending each week on this? If you are like most entrepreneurs, systems is not your favorite word. Wasn’t working for yourself supposed to mean that you could be free? That you would be master of your time and that no one (not even you) was going to be looking over your shoulder to see if you getting everything done? 1. Write down what your goals are for social media. Are you trying to get people to your website? Do you want them to fill out your email form? Are you trying to get in conversation with targeted sales prospects? Knowing this will help you plan out your strategy. 2. Set up a weekly posting schedule that includes having those goals met. For example, if you want to get people on your email list, you need to post your free offers at least a couple of times a week (every week). We see too many business owners posting their free offer one time and thinking that it is going to hang around and generate leads. Unfortunately, you have to post every piece of content multiple time to have a chance of reaching even a fraction of your followers. If you are trying to connect with key influencers or sales prospects, set up some lists in your accounts so you can be sure to see their postings. Comment, like and share on the stuff that they post. Engage with them by having two or three times a week on your to-do list that you deliberately seek them out. 3. Make content that fulfills your needs. We are setting up a local Denver business directory website and have some pages that we want to share frequently. This means that we cannot have just one picture on that page to post to Pinterest or share to social sites, we need to have multiple images that we can rotate through, mixing up the graphics so people don’t lose interest. Additionally, someone might respond to the picture of the young businessman and someone else might be attracted by the fun older woman. You have to know your demographic and figure out what the best ways to reach them are! You also have to have some kind of written content or a HUB where you can send people to. This site has over 300 different articles that I can share on my social media websites. Too often we find that a company will have a static website with 4-5 pages. There is just not enough there to provide a range of different posting opportunities for social. We recommend using a blog website and posting content at least once a week. Done for a year, that would be 52 articles that could be added to the social sharing mix. 4. You have to have an easy way to find and share other people’s stuff. We recommend having at least two posts a day to most social media websites like LinkedIn, Facebook pages and Google+ Pages. This will show anyone coming to your social properties that you are active PLUS it will allow you to post your marketing content more because it will be less spammy when woven into all those other posts. We use a combination platter to accomplish this. Second, we get email newsletters from trusted sources and pop some of that content into the mix to keep things fresh. We also keep our eyes open when we are surfing around and sometimes find bits that would make sense for our feeds. 5. Scheduling your own content. We will be spending the next month crafting graphics, writing posts and generally making sure that all our efforts are focused towards those two ends. We have recently switched back to Hootsuite.com for most of our social scheduling. For less than $10 a month we can have everything in one place for ourselves and our clients. We had been using Bufferapp.com but the cost for their business accounts was just prohibitive for how much we do. After hearing all that, you might want to tear your hairs out. How can you get all that content done, all those pictures made and all those posts scheduled? One thing that makes us sad is when people come to us and want to have social media success in a month. They say things like, “if I don’t see a return within a couple of weeks, I am going to try something else.” Social media marketing doesn’t work like that. You have to get started and build up your efforts over time, growing your followings and interacting with people and brands. This is not a quick fix to your sales efforts, it is impossible to make enough content or pictures BEFORE you get going. You have to build these things over time, with focused energy and a social media marketing system in place.